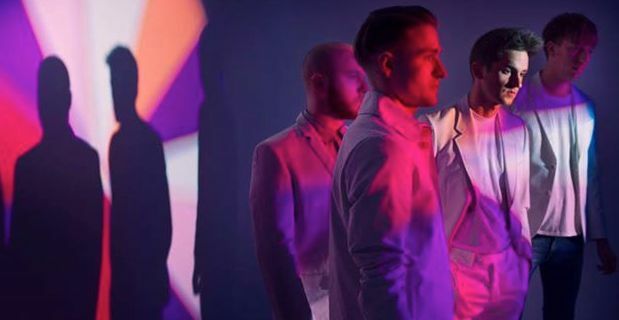 On the occasion of their live at Teatro Parenti in Milan we interview Wild Beasts. The English band released a few moths ago their fourth work "Present Tense", one of the most acclaimed album of 2014 so far. We are in the back of the theatre and our background music is provided by Girls In Hawaii doing their soundcheck - it’s Day 1 of the Elita Festival and, beside the two bands already named, there will be Joan As Policewoman too. And here we are with Chris Talbot and Ben Little, drummer and guitarist of the band respectively. We do not have so much time, later they will be busy doing a photographic set and so, after introducing ourselves, we start without further ado. We read that “Present Tense” wasn’t born playing together but writing separately and then joining the pieces in studio. How was it? Do you think you will ever do it again? Ben: I’m not sure if we will do it again in that way ‘cause you know, it happens all naturally. Certainly before “Present Tense” we worked together because we could afford to be in a room. But being in London it was quite hard to get together, to play together. Beside it was quite expensive to get us all together. So we started working separately on our computers, and the we met all together in a small room also around our computers and we did this thing like a “show and tell”, showing what we’ve been working on. Chris: We knew we were gonna make another record, but it was important for all of us to have kind of a bit of a steady life style after the last album “Smother”. We recombined after six-seven months we finished the “Smother” touring. B: It was the first time we had so much time. We were always touring and then writing an album. You know, after “Two Dancers” we had to strike the iron till it was hot and we came out with “Smother” quite quickly. C: Writing, recording, promoting, touring, it can be quite an endless cycle. It’s important to remember why you’re doing it in the first place. C: Yeah, it was the first time we could afford to do it. It was the first time we were self-sufficient. I don’t know if we will ever do it again because the way we do stuff is continuously changing and that’s what makes it exciting. You consider yourself more as a live band or as a studio band? C: Both! There’s not many people who are fortunate enough to do just one thing. The studio is certainly the most exciting place to be. But at the same time playing shows it’s very enjoyable. They’re completely different and important entity so i have to say it’s a fifty-fifty. In “Present Tense” we can hear many sounds inspired by electronic music. What about it? How did you choose to move in this direction? B: To use a football analogy, we started as a classic 4-4-2 indie guitar band. We were two guitars, bass and drums but we we’re all fan of bands like Radiohead. It’s just natural curiosity. You want to out try out things you’re not necessarily good at. We’re not trying to be master of electronic music. G: It’s the learning curve that excites you. It’s pushing yourself, surprising yourself, that’s really exciting. You chose Wanderlust as first single, which is kind of a rough and dark song, very different sounding from “Smother”’s first single “Albatross” - which was softer. Do these musical style changes reflect something deeper or is it just trying new sounds out? C: Wanderlust it’s the first song we demoed and it didn’t really change much from that first demo. We kinda captured the spirit straight-away and we wanted to replicate it across the record. It wasn’t supposed to be a single but it just became. It’s quite an angry sounding song. Also along the album we wanted to capture that ferocity and anger. B: After the last tour we realized it would be great to keep the soft side of “Smother” adding these new aggressive sounds, especially for live shows. C: (laughing) It looks such a beautiful day on the video, but i can’t tell how cold it was! It was so windy! We always struggled to be comfortable in front of the camera. We decided to use this David Byrne approach. I know we could do that still being ourselves and not looking like complete fools. I think videos are a good companion to the music but not so proud of our videos, we’ve got some really good videos but also a few weak ones. But this time we’re really happy with it. Hayden said: “You can't try and recapture the past” but many bands do the same again and again. What about it? C: Music can be quite a business but you can’t have a formula to write a hit song, to write a hit single, to write an album. That way doesn’t excite us. We want to create something new every time we go in the studio. B: It’s a really unique position being on Domino. They tell us: “What you wanna do?” We don’t have any pressure, it’s a great feeling, they trust us in what we do. Wild Beasts became soon a well known band. Did it change the way you make your music? Even before “Limbo Panto” you were more like a pop band, but then you started feeling more comfortable and tried making less “easy” music. Is it so? C: I think we still consider ourselves a pop band. But, again using the football analogy, goalposts changed. Now it’s more exciting for us to create what we think it’s exciting music, not always using the typical song structure A-B-A-B. We do think it’s kind of a value, it breaths life into records if you include mistakes, if you’re not trying always to be perfect. B: We’re all fan of pop artists Like Miley Cyrus. We like picking from different genres, even rap music, and mixing it all together: stealing from anyone is very exciting. Surely, one of Wild Beasts’ trademark is the duet between you and Hayden. During your evolution as a band Tom’s voice gained more and more space in the arrangement. Did it affect the way you write your songs? C: We’re very lucky to have two incredible singers like Tom and Hayden. We’re always stripping stuff away from our records allowing space for those voices but we treat the voice as we treat any other instrument. It’s just another string to the bow. Chris, you’re quite a particular and very recognizable drummer. How did you develop your style? For example, when did you start adding bongos in you kit? C: Bongos were actually an addiction from our first producer. There was this song in Limbo Panto called “The Old Dog” which originally had handclaps and he just said “Try bongos!” and i thought it was a great idea. I’ve always played them but not in the band. So i started practicing them. As i was saying about electronic music, we’re not trying to be master of an instrument, learning how to play “properly”. We enjoy exploring and experimenting. I don’t think i’m a great drummer but that’s not what i want to be. Are you already thinking what you will do next or are you just enjoying the tour? C: Now we want to play live and share this new music, it’s still very fresh. Certainly we will do another record but it has to happen naturally. B: Write and record a whole album is so hard! It takes a huge amount of time! Now we’re touring and we’re enjoying this moment. C: Maybe we will not take as long as “Present Tense” but it’s too far on the horizon. Are you gonna cover “Wrecking Ball” by Miley Cyrus tonight?